Located in the community of Chutan Bajo, 4 kilometers from San Gabriel.The Cascada de Paluz has approximately 25 meters of water fall.The fall of its waters is born in the large wetlands of the páramo and forming small streams that converge in the San Gabriel River, in its path the waters rush precipitously, impacting the rock formations that produce a light drizzle that generates freshness and charm to the visitor .The waterfall has a steep relief geomorphology in which inseptisoles are found, which are derived from pyroclastic, allophalic and sandy loam materials, have a great water retention capacity and at the same time have a thick yellow horizon. Because it is in a hollow, its surroundings enclose an interesting landscape and it is appreciated from the high part where the path that leads to the waterfall begins. 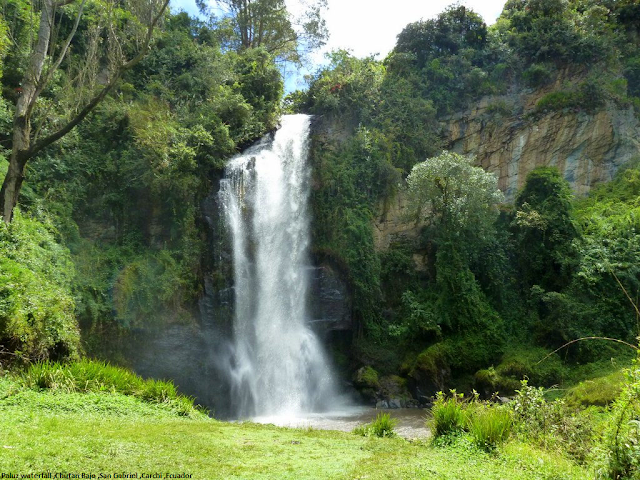 The Paluz waterfall, a waterfall that falls between two hillsides and breaks through the potato crops, is another natural tourist center that is located 4 km from San Gabriel and 25 minutes north-west. It has approximately 25 meters of water fall formed from the river of its same name.